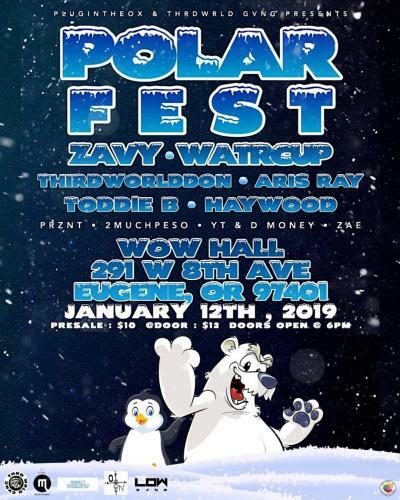 On Saturday, January 12, Plugintheox & Thrdwrld Gvng present Polar Fest at the WOW Hall featuring: Zavy, Watrcup, Thirdworlddon, ToddIE B, Aris Ray, Haywood, Prznt, 2muchpeso, YT & D Money, and Zae. Xavier Young, a.k.a. Zavy, is a 20-year-old artist from southern California who cannot be placed in a single genre. He can both sing and rap with powerful emotion that presents the mark of future success. Zavy grew up in Orange County listening to a wide variety of music that influenced his style. Zavy’s uncle, J.R., is the lead singer for the island reggae group Common Kings, a group that has done many tours including several shows at the WOW Hall. Surrounded by the musical passion of his family, Xavier started developing his talent for writing and performing early. His efforts began to draw attention in high school. He sang at his graduation and during his senior year a video of him rapping about the death of his grandfather went viral. Zavy prides himself on being a versatile artist, which allows him to win new fans from different niches. From young children to older listeners, he has produced songs that everyone can like. A staple of his style is singing, which allows him to harmonize and add depth to his songs. Come experience the passion he injects into his wide style of music. From Calabasas, CA Watrcup is stepping into the music industry at twenty years young. Having a life long passion for music and releasing his first song just at age 19, he’s been perfecting his flow and mastering his craft with ambitions of being the industry’s next top MC. Watr’s witty lyricism and alternative vibe makes him stand out as one of underground rap’s most promising new artists. With fifteen songs out and hundreds on the way, Watr has been garnering a west coast fan base, performing shows in LA and Eugene and opening for big names like Nef the Pharaoh and Curren$y. Christian Haywood a.k.a. Haywood (born October 29, 1991 in Fresno) is an American rapper, singer, songwriter and producer. He released his second official EP, Product, on October 21. Haywood has been writing music since he was nine years old. Major influences were artists such as Talib Kwali, Nas and local artists from his hometown. At the age of 13, he recorded his first freestyle. From age 16 on, Haywood began to create beats for himself, becoming self sufficient as a producer. He picked up audio engineering skills while recording his own music at home. After graduating from the University of Oregon in 2015 as a Bachelor of Science; Haywood continued recording his music and later started EL-Clique Recordings at Artistic Outlet Media in Eugene. Later that year, he was signed to The Private Plane, a record label created by Malik Yusef of Kanye West's GOOD Music. Since then he’s started his own music business called EL-Clique Entertainment LLC — an independent record label / music collective, as well as a merchandise clothing line and his own recording studio. Born and raised in Cincinnati and now residing in Los Angeles, rapper and Xanarchy member Aris Ray (older brother of rising R&B star Arin Ray) is far from a new face in the music industry. Aris is known as a top-notch lyricist who delivers flows that are sure to keep you jamming. He attributes his style to influences such Kid Cudi, Kanye West and Lil Wayne. With all the music he has in the vault, Aris does not like to put himself in a single box. He is set to release a copious amount of new music and plans to make 2019 his biggest year to date. Outside of recording and releasing his own material, Aris is known for penning a number of songs with big name artists ranging from Lil Xan to Noah Cyrus. Tickets are $10 in advance, $12 day of show. Doors open and show begins at 6:00 pm.